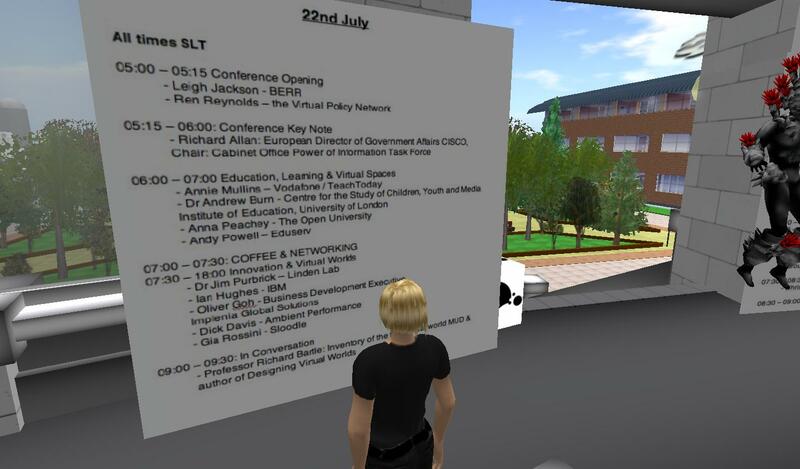 Today I attended part of the Virtual Policy ’08 conference on innovation and govenance in virtual worlds. Ren Renolds from The Virtual Policy Network explained that the purpose of both the network and the conference is to bring people together to stimulate converstions about virtul policy, especially intellectual property. Richard Allan (European Director of Government Affairs CISCO) gave an interesting keynote addressing several important questions for our legislators to consider. Among other things Allan spoke about his personal use of different avatars in different situations – something which was highly commented both by RL and SL audience. I guess this question whiter or not to present yourself in an anonymous way in virtual life causes quite polarized views. I personally still only have one avatar in SL, and this is primarily because I want my students and my other relations to be able to trust me, but I have to admit, that it’s a tricky issue .. and for sure something I’ll return to during my PhD. The conference was streamed to us in the SGI Nexus Event Auditorium, but unfortunately especially the pictures were very poor – in fact very pixelly and multi-coloured. Anyway, the sound was ok most of the time, and I do think that’s the most important. Annie Mullins (Vodatone/TeachToday), Andrew Burn (University of London), Anna Peachy (The Open University) and Andy Powell (EDUserv) discussed the learning potential of virtual worlds. Andrew Burn told of differentiated experiences, with improved effects in distance learning, the use of virtual worlds as new, expressive media and the possibility of virtual field trips and role play. And in general many positive reactions from different types of students, except some on-campus students, who really did prefer face-to-face encounters. 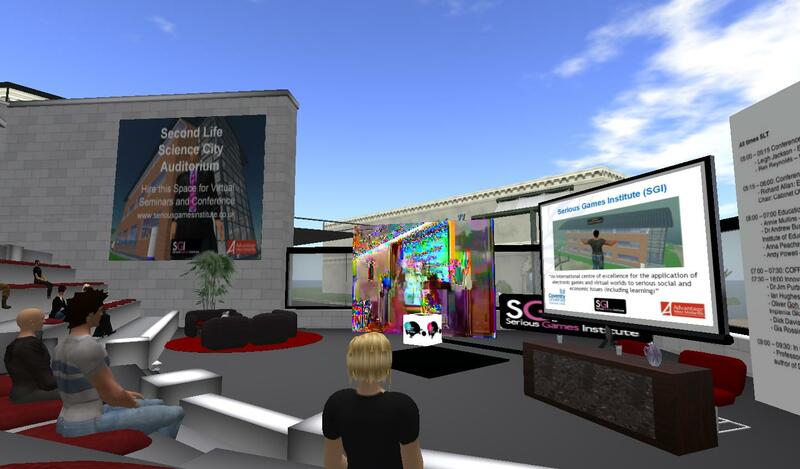 In the midst of the discussion, we received a very interesting link to a paper on experiences with teaching in SL by Diane Carr. Andy Powell spoke of the lack of “hard methodological evidence” of the effect/impact of learning in virtual worlds. There are plenty of good private teacher anecdotes, but for virtual worlds to truly become embedded in our schools/institutions we need hard evidence ..
Unluckily Linden Lab sent a message on region maintenance at the end of this session, so I chose to return to RL, but I’ll be back tomorrow to listen in on at least the discussion about intellectual property.